Costa Dorada is the most visited destination in the Mediterranean. Here you’ll find the most beautiful beaches of the Mediterranean, crystal clear waters and fine sandy beaches. Costa Dorada is a great place for a holiday. Bring your entire family or hang out with your friends in the beach resorts, chill out in a bar by the beach or play golf. At Tarragona, you’re in for some treats. There you’ll find several historical ruins as well as several museums: the Roman ruins of Tarraco, The Roman Aqueduct and the Gothic cathedral. What’s great about Costa Dorada is of course its climate. Enjoy the Mediterranean climate with temperatures ranging from 20 to 26 degrees Celsius during summer while during August it could peak to 34 degrees Celsius. It’s indeed warm here during day. 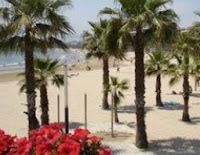 Costa Dorada is a great place for all tastes: its water or natural parks, beaches, bars or museums will provide a great holiday.